If I wrote for a certain gossip publication, I would probably say Tom Hanks ‘won the Golden Globes by delivering a tray of martini’s and it is so pure I am feeling all the feels and am like literally crying right now’. 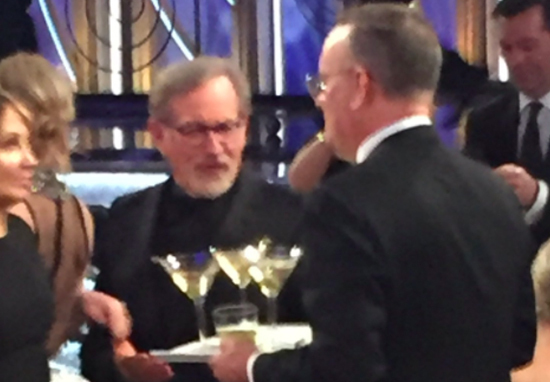 But Tom Hanks delivering a tray of martini’s is admittedly a great sight. The fact that the Globes serves its guests alcohol alone is good enough. Unlike the Oscars, where attendees are forced to sit through seventeen-hours of acceptance speeches and sentimentality zero sheets to the wind, the Globes plies its A-listers with booze making it that little less insufferable. It appears as if Tom Hanks was making the most of this at Sunday’s award show, making his way to the bar during the first ad break to get the round for his mates, which included director Steven Spielberg. Various lucky ducks saw the event unfolding in front of their very eyes. It wasn’t the only highlight of the show. Oprah Winfrey, of course, accepted the Cecil B. DeMille award and delivered a stirring nine-minute speech that covered the topic of race in America. In 1964, I was a little girl sitting on the linoleum floor of my mother’s house in Milwaukee watching Anne Bancroft present the Oscar for best actor at the 36th Academy Awards,” she began. “She opened the envelope and said five words that literally made history: ‘The winner is Sidney Poitier. In 1982, Sidney received the Cecil B. DeMille award right here at the Golden Globes and it is not lost on me that at this moment, there are some little girls watching as I become the first black woman to be given this same award. It is an honour—it is an honour and it is a privilege. Following last year’s reckoning with the exposé of several Hollywood predators and the subsequent #MeToo campaign, Oprah also expressed sympathy and solidarity to those who have ever been harassed. I’ve interviewed and portrayed people who’ve withstood some of the ugliest things life can throw at you, but the one quality all of them seem to share is an ability to maintain hope for a brighter morning, even during our darkest nights. So I want all the girls watching here, now, to know that a new day is on the horizon! And when that new day finally dawns, it will be because of a lot of magnificent women, many of whom are right here in this room tonight, and some pretty phenomenal men, fighting hard to make sure that they become the leaders who take us to the time when nobody ever has to say ‘Me too’ again. Meryl Streep was so moved by the speech that she said Winfrey ‘now doesn’t have a choice’ but to run for president, reports Mashable.